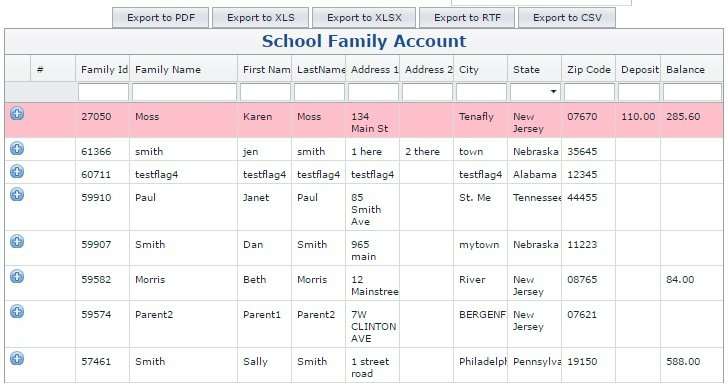 Family invoices combine the invoices of all members within a family. See a short video on how it works! 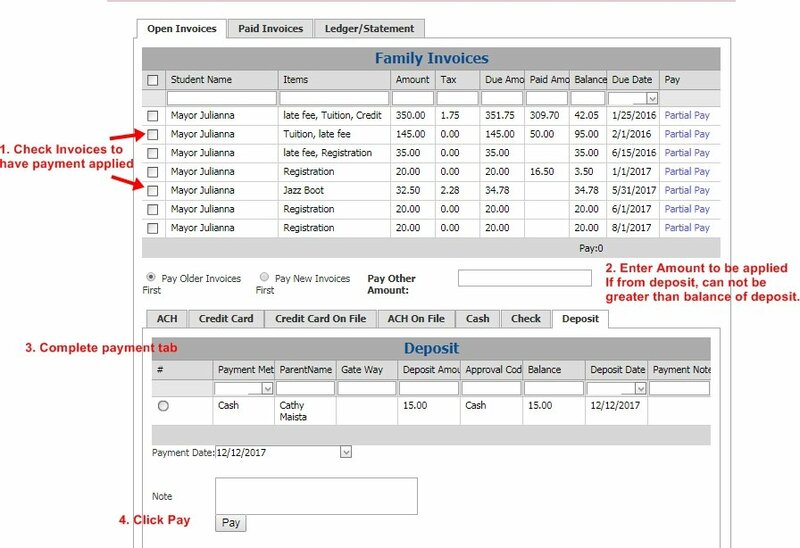 Under the Billing menu, select View/Pay Family Invoices It will display the contact information for the family, available deposit balance and open invoice balance. Open invoice includes any invoices with an unpaid balance. You may click on a Student’s name to go back to their Student Account on the Student Page. In the 2nd tab, Paid invoices only show invoices that are paid in full. Partially paid invoices are still in the Open Invoices tab. 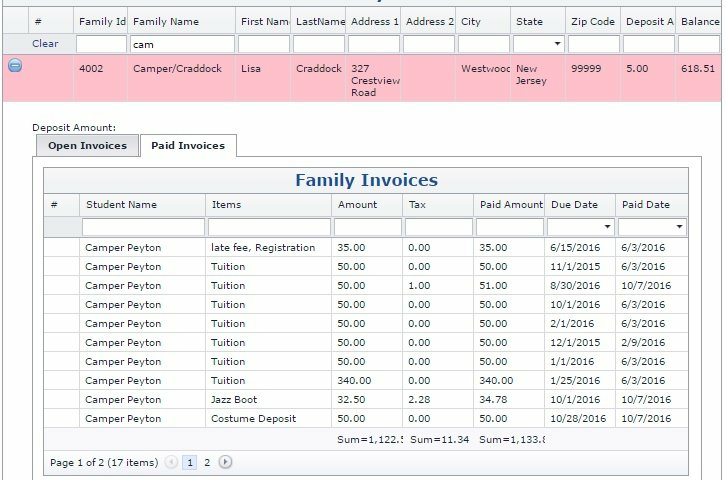 The pay amount (sum of the balances of checked invoices) will be totalled under the Balance Column. Select payment type tab and enter information. Note – is an optional field and allows you to enter a message. The NOTE will be shown on the Statements. You are given an option to View the payments applied after the amount is processed. You may also create a receipt to print or email. 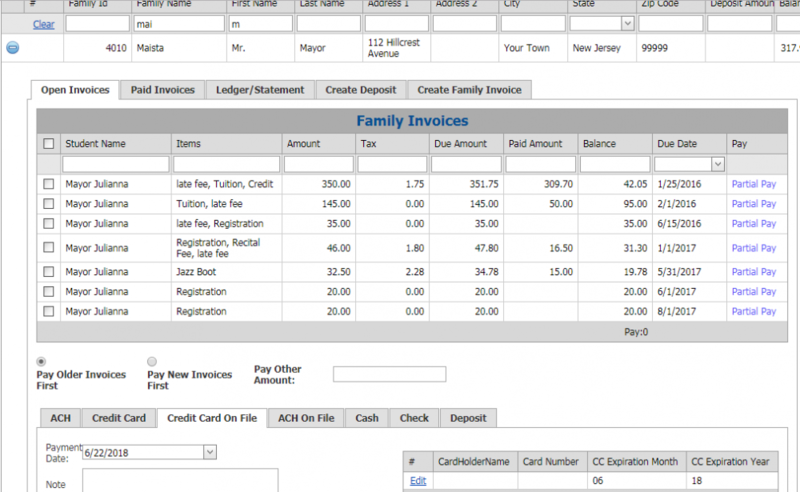 You can now set the amount to be applied to invoices in the billing-View/Pay Family Invoices screen. To turn on this feature, go to Admin-Gateway tab. Click Edit on the Gateway line. Check it if you want this feature. Then click Update. To use, if you are receiving a payment other than the total Pay of the invoices checked, you can enter this amount in the Pay Other Amount box. Enter the payment information and click pay. !If you are paying from a deposit, you enter the balance of the deposit in the other amount box to apply it to sibling invoices. If the amount entered is less than the total balance of the invoices selected, you will see the following message. If you enter an amount greater than the balance of the invoices, it will ask if you want the overage to create a deposit. If you answer no to making a deposit, the system will bring you back to the invoice list. No payment has been made. *You may still use the partial pay option if you wish to determine how payment is applied to invoices with multiple charges. If you wish to designate how the payment is applied to an individual invoice, usually if more than 1 income category is charged. Select Partial Pay on the right side of the invoice you wish to designate payment to. – You will be brought to a screen for a single invoice. It will not apply payment to any other invoice. Then follow How to Partial Pay an individual invoice.